Why Do Some Companies Charge More to Clean Berber Carpet? Have you ever noticed in carpet cleaning ads at the bottom of the coupon or special offer in fine print it states, “Extra Cost for Berber?” Why is that? Is it because it is made from something completely rare? Is it hard to clean? Does it need a special cleaning agent? Do you question why the higher price or book the job? Or perhaps, you don’t know that you’re being charged more for Berber. Berber carpet refers to a style of carpet distinguished by a loop pile construction. Berber carpets are common in today’s modern world because they are cheaper, durable and generally composed of a plain color with no pattern and sometimes contain a color flake in the mix. Today, Berber carpets are made from a wide variety of materials such as; the common ones: nylon, olefin and wool. A variety of manufacturers produce a Berber product. Olefin is the most common used material for Berber carpet and is the most affordable as well. So what is olefin? Olefin is a synthetic fiber made from a polyolefin such as polypropylene aka plastic! It is commonly used in a wide range of products produced in our society today. The advantages of olefin are strength, colorfastness, resistance to things such as: staining, mildew, abrasion and sunlight. The color of the olefin carpet is produced during the production process and is highly resistant to dyeing. Therefore, resistant to removing the color from bleach products. 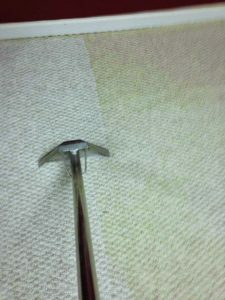 The reason carpet cleaners like to charge more for Berber carpet is because it can be difficult to clean if the dirt gets lodged into the loop pile fibers. “Time is money!” Kind of theory. When cleaning an olefin Berber, professionals need to be careful with cleaning agents and use the correct pH. A high alkaline pH can burn olefin which appears as yellow or brown splotches. So therefore, the cleaner must have a selection of cleaning agents available to handle the job. “Selection is money!” Kind of theory. As with all carpets, Berber should be cleaned every 6 to 12 months to prevent permanent wear patterns and the application of Teflon protector can further protect your investment and increase the carpets life. Save Money with Magic Carpet! The next time you’re calling carpet cleaning companies for quotes or checking out the latest coupon mailer, have your “Why?” questions ready if they try to charge more for Berber. At Magic Carpet, you won’t be charged extra for Berber. Do it the Right Way, The Magic Way!